Mexico: Crime and Violence Evaluation - With support from USAID/Mexico, CDF and the Center on Conflict and Development at Texas A&M University are conducting a multi-year evaluation of municipal crime and violence prevention efforts in four municipalities: Chihuahua, Juarez, Monterrey, and Tijuana. The purpose of the evaluation is to support local stakeholders to examine the contribution of multi-sectoral, municipal prevention strategies and local system strengthening efforts to sustainable reductions in crime and violence rates, and use the lessons learned to adapt policies and programming. El Salvador: Youth Development Program - CDF supported Food for the Poor and the New Horizons for the Poor Foundation in El Salvador to complete a collaborative program to establish hydroponic gardens and promote youth development activities to help keep youth out of gangs. Through this program, youth participated in social inclusion and innovative crop production activities that are part of Food for the Poor's Agriculture for Peace project, which is conducted in communities vulnerable to recruitment by the 18 revolutionary gangs in El Salvador. Guatemala: Play for Peace Workshops: CDF continues to "grow good kids" through Junior Master Gardener® programs for Guatemalan kids living in coffee-growing communities. Gardens are safe places to promote inclusion and teamwork. We are now combining gardening and nutrition activities with Play for Peace® workshops to help form the next generation of peacebuilders. Through collaborative play, we teach Mayan kids how to cope with stress due to insecure and unfamiliar environments, poverty, and discrimination. Through the Play for Peace model, kids can become architects and leaders of sustained peace. CDF is partnering with several organizations to implement a number of projects to combat violence and promote peace through food security, local organizations, and youth engagement in communities struggling to recover from war. Salvadoran youth participating in teamwork activities as part of our Youth Development project. A Mayan family in a coffee-growing community in Guatemala participating in our Junior Master Gardener activities. 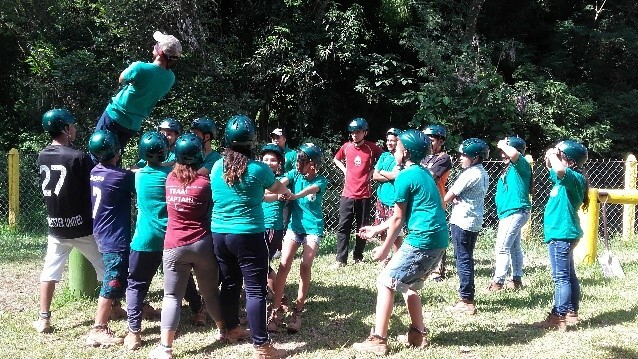 Texas A&M University students conducting youth development activities in a rural school in a Guatemalan village, nestled within coffee plantations. The Conflict and Development Foundation is engaged across Eastern Congo to advance agricultural production systems, protect natural resources, and build capacity for governance and stability in the region. CDF and Texas A&M University's Center on Conflict and Development established the Congo Peace Center (CPC) at the Université Catholique du Graben (UCG) in Butembo, North Kivu to support and achieve sustainable peace in the Democratic Republic of the Congo (DRC) and facilitate its integration into a more stable and peaceful Great Lakes region. The center aims to promote regional dialogue, conflict and development publications, and other activities with the goal of leading to stability. The CPC is committed to achieving good governance, inclusive economic development, and national integration and reconciliation. Focus on institutional development and transparency in decision-making as a key to progress and sustainability. Conflict & Development Foundation's Program in Botswana (Ecoexist) seeks to reduce conflict and foster coexistence between elephants and people. In an area of northern Botswana roughly the size of Yellowstone National Park, 15,000 elephants compete with 15,000 people for access to water, food, and land. These elephants are not neatly contained in parks - they roam freely, often in areas where people are planting fields, herding livestock, and walking their children home from school. As more land is converted to arable farming and as the elephants' range expands, encounters between people and elephants are becoming more frequent as are incidents of devastating human-elephant conflict. Ecoexist seeks to reduce conflict and foster coexistence between elephants and people. The team finds and facilitates solutions that work for both species. Our approach connects science with practice. In the short term, we empower farmers with practical, affordable, and effective tools to reduce conflicts with elephants. In the long-term, we collaborate with local, national and international stakeholders to develop political and economic strategies for addressing the root causes of conflict. We endeavor to address human-elephant conflict in ways that may be modeled throughout Botswana and beyond. Visit ecoexistproject.org for more information. The Conflict and Development Foundation supports the ongoing research, extension, and development efforts of conservation agriculture production systems in Ghana. This is carried out through a variety of programs looking at on-farm production management, land tenure systems, and soil fertility trials across Ghana. The main focus is the Center for Conservation Agriculture which serves as a research and training center in a public-private partnership between agribusiness and agricultural institutions. This first of its kind institution that serves as a focal point for no-till research and activities as part of a Brown Revolution soil conservation approach. This center’s research will be a world-class in-field example of how conservation-based techniques can lead to better long-term results for smallholder farmers around the world than traditional practices, and its outreach activities will make it well known throughout Ghana, then West Africa, and eventually across the continent of Africa. The center designs, tests, and implements context-appropriate, high-yielding, conservation-based agriculture systems for rural smallholder farmers in Africa. All photography provided by Joseph King.